Bhutan -a landlocked country in South Asia located in eastern Himalayas. Bhutan is situated in ancient Silk Road between Tibet and Indian subcontinent and Southeast Asia. Bhutan is known as the Land of Thunder Dragon due to the violent and large thunderstorms which whip down through the valleys from the Himalayas. Landscape of Bhutan is ranging from lush subtropical plains in south to sub-alpine Himalayan Mountains in north. 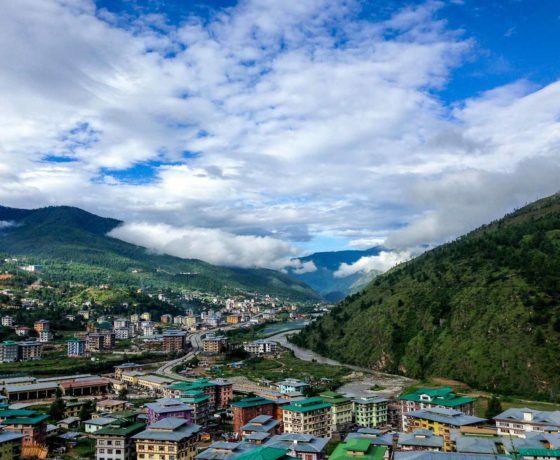 Thimphu is capital as well largest city of the country. The highest mountain peak in Bhutan is the Gangkhar Puensum. Bhutan is predominantly Buddhist country having Dzongkha as a national language. 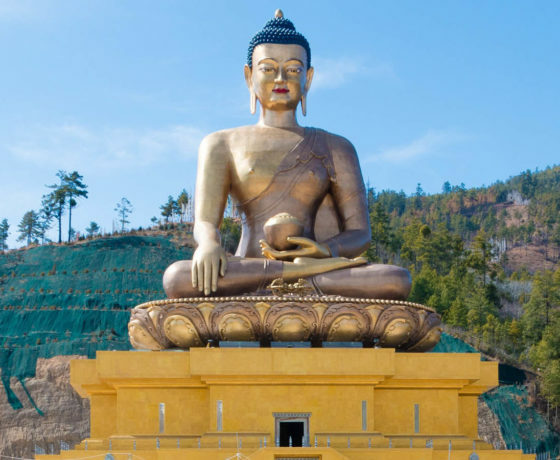 Bhutan is one of the most scenic regions in Asia eminent for its grand simplicity and graceful purity as dense forests, majestic mountains, and austere monasteries. Bhutan, a small country in Himalayas has dazzling natural scenery, scenic culture and tradition. It is only nation in the world having Vajrayana Buddhism and profound teachings of this tradition. Kingdom of Bhutan is referred as The Last Shangrila because of its unspoiled environment and melodious society. It is world’s last remaining Buddhist Kingdom. Bhutan – the last true Illusion of Shangri-La is known for its beautiful landscape and Buddhist monasteries. 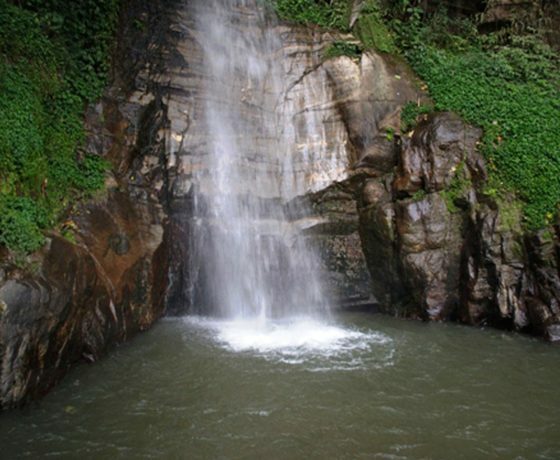 It is considered as best getaway for families, friends, backpackers and adventure & nature lovers. The Land of Thundering Dragon is paradise destination for mountaineer. For adventure enthusiasts, opportunities for rock climbing, rafting, kayaking and trekking are readily available in Bhutan. Apart from being a tranquil retreat in the lap of nature, Bhutan is also an excellent choice for a honeymoon. A siesta in a country full of incredible sights, remarkable flora and fauna, and various hues of traditions is an exceptional way to start a new chapter of life. 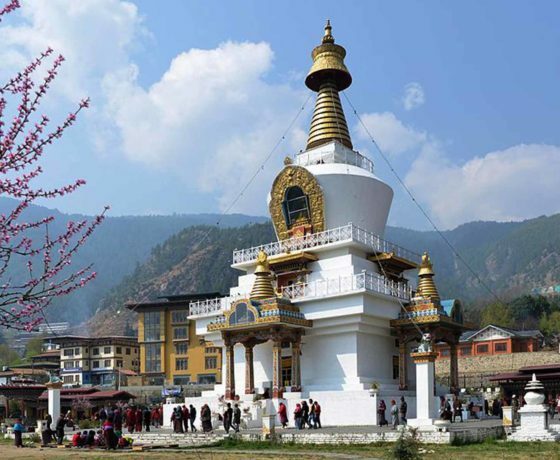 Topmost tourist places of Bhutan are as Thimphu, Paro, Phuentsholing, Bumthang, Mongar, Lhuntse, Phobjikha, Gangtey, Haa and Punakha in terms of gorgeous natural beauty, monasteries, nunneries and mountain valleys. Thimpu: Capital and largest city of Kingdom of Bhutan. 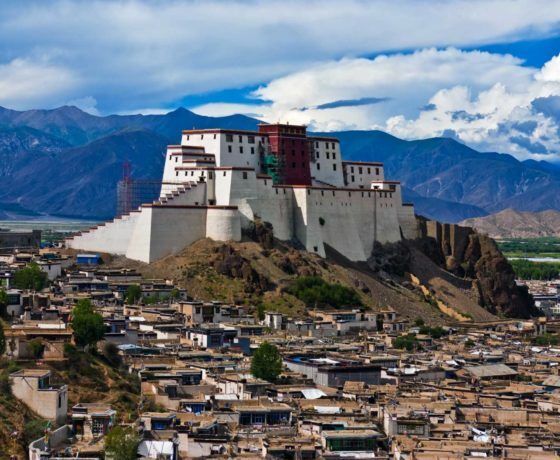 There are numerous traditional architectural monuments as monasteries, dzongs, chortens, gateways, Lhakhangs, royal palaces, and many more sacred sites. Prayer Flags, Mani Walls and Prayer Wheels. Paro: A historic town in dazzling Paro Valley adorned with various sacred sites and historical buildings. Visit Rinpung Dzong- a fortress-monastery built in 10th century. 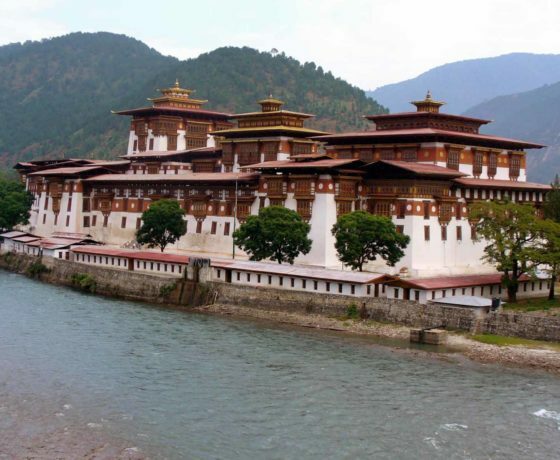 Punakha Dzong: Known as Pungthang Dewachen Phodrang- Palace of Great Happiness is second oldest and largest dzong in Bhutan. 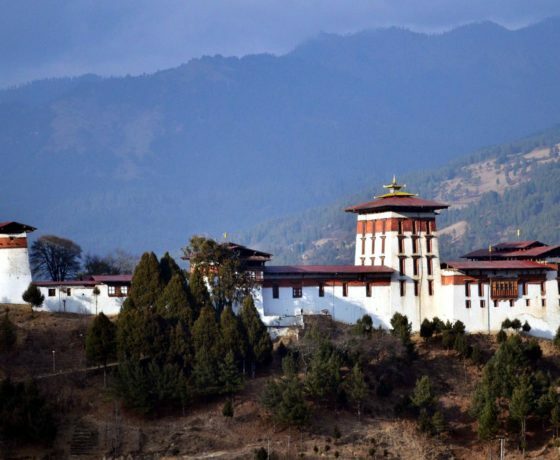 It is extremely beautiful and majestic dzong of the country. Tiger’s Nest Monastery: Called as Taktsang Monastery located in Paro is one of the holiest shrines hangs on a cliff & stands above an enchanting forest of blue pines and rhododendrons. Zuri Dzong Hike: The peak of the Zuri Dzong Trek is ideal place to see varied birds throughout Paro valley. It has a cave where Buddha came to meditate in 8th century. Phobjikha & Gangtey Valley: Phobjikha & Gangtey Valley: Both are Gangtey and Phobjikha are glacial valleys with a stream flowing through their open grasslands. 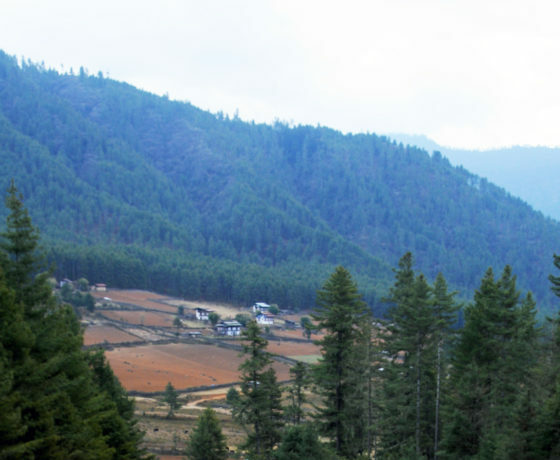 Bumthang Valley: Bumthang Valley, spiritual heartland of Bhutan is filled with many ancient and precious Buddhist sites. It is a religious hub of Bhutan housing oldest Buddhist temples. The climate in Bhutan is varies with elevation from subtropical to highlands and polar-type climate. There are five distinct seasons as summer, monsoon, autumn, winter and spring. Western Bhutan has heavier monsoon rains, southern Bhutan has hot humid summers & cool winters, central and eastern Bhutan is temperate and drier. 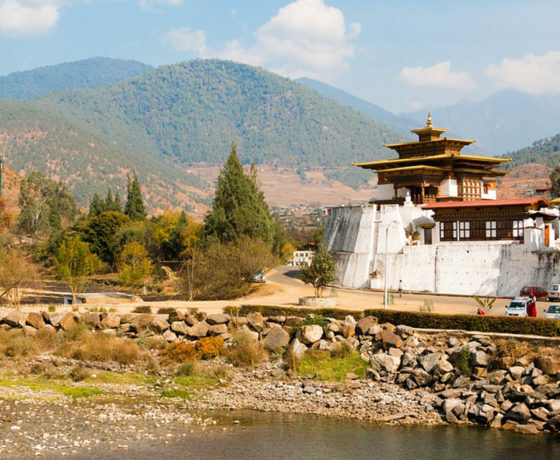 October to December is perfect time to visit Bhutan because of the air is clear with sunny skies. January and February are colder. Locals are very sensitive, you may don’t want to sound rude. Always ask for permission if you are photographing a person. Dress modestly. Singlet and miniskirts are not well accepted norms. Enter temples and monasteries only if you have permission. Leave your camera at a safe place, if photography is prohibited. Use your right hand or both hands to give or receive. Leave a donation at the temple is at personal discretion. Use your palm to show rather than finger, when pointing. Pass clockwise at all chortens and mani walls. Please ensure that you have proper & valid bills if you buy any antiques from Bhutan. Tipping to hotel staffs, guides and drivers should always be given in envelopes. Please ensure that your luggage is properly packed and counted. Your guide shall be with you during the tour. Before end and starting of each day, guide shall discuss with you timings for tomorrow. Do not passing negative comments on religion, the royal family and chief abbot. Please do not use tobacco products in Public places. Don’t take pictures of religious sites, people or private properties without permissions. Do not utilize hats and sunglasses inside religious places as dzongs & monasteries. Do not point your feet at anyone. Cross your legs or kneel sitting in religious places. Don’t wash, swim or throw objects into lakes, many of which are considered sacred.